Instagram makes it easy to share your content and browse through other users’ posts, but there is no easy button to save or download Instagram videos. Pictures can be saved fairly easily by taking a screenshot and re-cropping the image, but videos cannot be simply screenshot. If you’re looking to save an Instagram video for later, follow our guide. If you want to save your own Instagram videos, the process is fairly simple. Many users have their account settings preset to download any of the content they post, so your video may already be on your camera roll. If you need to save a new copy, follow these simple steps. You can adjust your settings so that photos and videos automatically download to your device when you post them. To fix your settings to download Instagram videos from your posts, follow these steps. Open your account menu by clicking the three vertical lines at the top right corner of your screen. Click “Settings” at the bottom of the menu. Under the “Account” heading, click “Original Photos”. Switch “Save Original Photos” on to save all originally posted photos and videos. Once you save these settings, all of your previous posts will be downloaded to your camera roll on your mobile device. Saving your Instagram story is even simpler. You have a few options depending on if you want to save your whole story as a video, or the individual photos or videos within your story. Before you’ve posted your story, press “Save” at the bottom of your screen after you’ve edited the photo or video you’re posting to your story, and it will save to your camera roll. Click the three dots at the bottom right of the photo or video you’d like to save. Click “Save Photo/Video” to save the single photo or video, or click “Save Story” to save your whole story as a video. If you’re looking to save a video to view at another time but you don’t need it downloaded onto your phone or computer, you can bookmark it for later. This saves the videos or photos privately on your Instagram account, but does not save it to your camera roll to be posted or shared via another app. To save a photo or video, simply click the bookmark icon below the post. To save a post to a collection, hold down the bookmark icon and select an existing collection or click the plus sign to create a new one. Collections make it easier to categorize your saved posts by labels created by you. Unfortunately, Instagram does not have a button to download videos or pictures from other users. There are, however, websites and apps designed to easily download videos and save them to your camera roll so that you can send the video to friends, post it on other social media platforms, or simply save it for a rainy day. Try these websites and apps to download Instagram videos. PostGraber is a website that makes it easy to download videos from Instagram. All you have to do is click the three dots at the top right corner of the post on Instagram and click “Copy Link” from the menu that pops up. If you’re on the browser version of Instagram, simply copy the URL. Paste the link into PostGraber, and it will download any pictures or videos from that link, making it easier to save a series of photos posted together. Another website, Gramblast, has a similar downloader. Simply copy the link to the post you want to download, and paste the link to the tool on Gramblast to download your content. Only public photos can be downloaded on this website to protect privacy. IFTTT, short for If This, Then That, helps connect your apps. 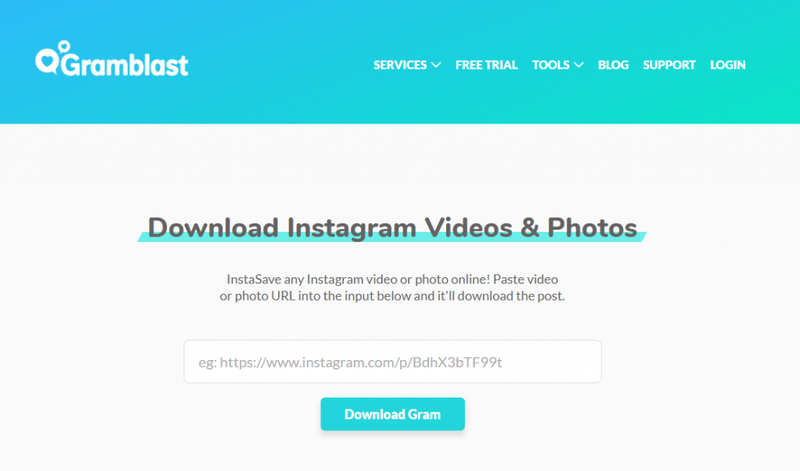 To use this website to download Instagram videos, you’ll need to create an account with IFTTT and Dropbox. Once those accounts are set up, click “Save your Instagram videos to a Dropbox folder” on IFTTT. You can adjust the settings to save only videos you post or even any video that you like on Instagram. To learn how to use IFTTT, check out this guide to IFTTT. If you’re not afraid to dive into the code on an Instagram post, it only takes a few simple steps to download a photo or video from Instagram. You’ll have to use the web browser version of Instagram for this method to work. Follow these steps to download a video directly from Instagram. On your web browser, open the post that you want to download. Left click somewhere in the window, but not on the video itself. When a menu appears, click “View Page Source” or “Inspect Element” depending on your browser. This will bring up the source code. Use the keyboard shortcut “Ctrl+F” (or “Command+F” on a Mac) to search the browser for text. The browser will highlight any use of “mp4” in the code. Highlight and copy the first full URL that includes the highlighted “mp4” seen below in orange. Paste the URL into a new browser window. This will bring up the video from the post. Right click anywhere on the video and click “Save Video As” to save it to your computer.